Skyhi: When playing White there is a certain player who always plays sanrensei against me. When I use the standard approach to Black's corner, Black responds with a two-space high pincer, as apposed to the 'normal' one-space low pincer. I can usually cope with the low pincer. I have found that patience usually pays off for me and I can win in the middle game, but this move always makes me panic. From my research it doesn't show up much in professional games, so there must be a good reason for this :). The first few times I invaded at 3-3 and Black blocked from below to form a wall facing the bottom. I did not do well. Now I have completely no clue what to do! Then the continuation goes something like this. 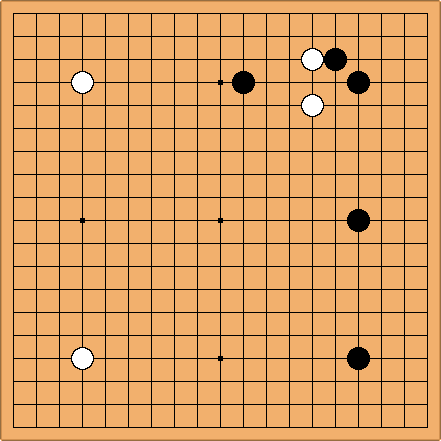 Dieter: I'm only 1 dan myself but I would feel very happy if Black plays this. Suppose we defer the exchange of the marked stones. 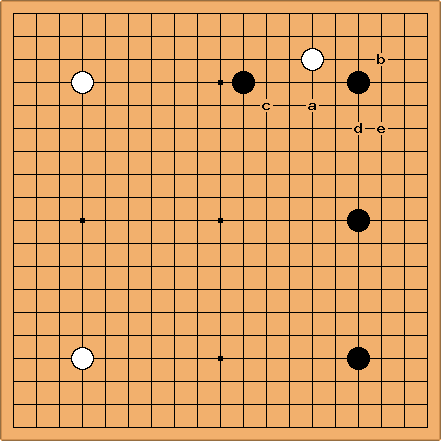 Black 1 and 3 crawl along the second line while strengthening White in the center. This is already inconsistent with his center-oriented sanrensei strategy. On top of that, Black plays the marked stone too close to White's strength, allowing you a perfect pincer-extension with your marked stone. Confused: Digging int the joseki library, following joseki-moves (a-e) came up. As I'm a very weak player, I couldn't advise you what is good and what isn't in this situation. I'm just a monkey transcribing from the book. If you want more details on any variant, I can transcribe it for you too. In variant A. the standard answer for Black is supposed to be 2, followed by White a or b. I guess, there's reasons for it, compared to attacking the white stone. But as said before, that's still beyond my skills. For the 3-3 invasion, the sequence looks like this. Black 2 at 3 is marked as a bad move. 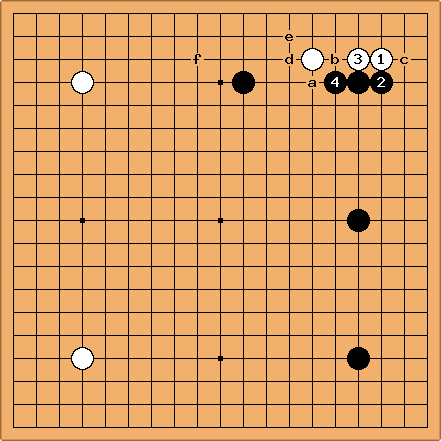 After 4, White can go on with any of the points at a-e. Here f is given as a follow-up move. There would be nothing seriously wrong with White playing this way, followed by White a, Black b, White c. This sort of thing happens in pro games. The problem with making a weak group on the edge of the sanrensei is that ... what you really want is a strong group there. If you make a weak group on the edge of your opponent's framework, you are disregarding framework theory. You put your opponent in a position to expand the framework by attacking. --- Back to the original problem.